Optimum Mineralization comes with free US shipping. Has 3 times the mineral concentration of your blood and 78 minerals and marine co-factors for energizing, mental focus, sports performance, challenged immune systems, and rapid re-mineralization. Earn up to 190 DR Reward Points. 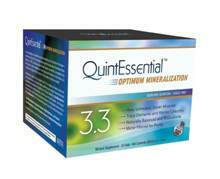 QuintEssential Optimum Mineralization 3.3 has 3 times the mineral concentration of your blood. Exactly the same as Original Quinton Hypertonic from Spain, but easier to open. Comes with free US shipping! QuintEssential marine plasma has been applied by thousands of doctors in clinical and emergency settings for over 100 years throughout Europe, Asia, and South America. At one time, the Quinton family funded 69 free clinics throughout Europe to dispense QuintEssential to those in need. 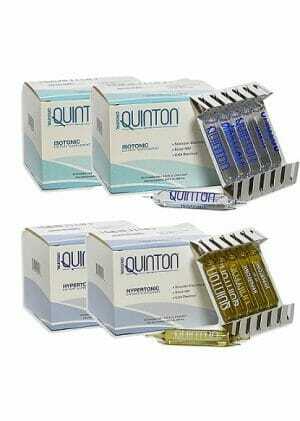 QuintEssential was secretly used by the French Army as a blood plasma replacement. QuintEssential was featured in the Dictionnaire Vidal (France’s equivalent of the Physicians’ Desk Reference) from 1953 to 1999. Optimum Mineralization 3.3 is pure marine plasma that is three times the mineral concentration of your blood and is the most potent, making it highly hypertonic. Optimum Mineralization 3.3 is ideal for energizing, rapid re-mineralization, and building the physiology. Health professionals report application for dramatic energy increases, mental focus, sports performance and challenged immune systems. Optimum Mineralization 3.3 is a good way to start your protocol if you are generally healthily or looking for athletic performance. Many Optimum Mineralization 3.3 users report positive results switching to Bioterrain Restore 0.9 after several months and back to Optimum Mineralization 3.3 occasionally to regulate their system. After trying both, many just “know” which one they need when. QuintEssential marine plasma is the living fluid produced by, and harvested from, an oceanic plankton bloom. Discovered by French physiologist René Quinton in 1897, this nutrient-rich seawater (cold sterilized and processed according to pharmaceutical grades) has been used for over 110 years to restore the bio-terrain. QuintEssential Optimum Mineralization 3.3 is a nutrient-rich marine fluid that is harvested from the depths of a particular oceanic plankton bloom using the same harvesting method developed by French physiologist and humanitarian René Quinton over 110 years ago. QuintEssential Optimum Mineralization 3.3 is not just seawater. It’s a unique marine Plasma harvested from one vortex plankton bloom, at certain times, under certain conditions. It has proven to be an incredibly effective way to restore cellular homeostasis and mineral balance. Microscopic sea organisms create QuintEssential Marine Plasma. It has been speculated that the secret of our biological ancestry lies in these microscopic organisms. A complete spectrum of minerals is necessary to metabolize 100% of the amino acids we consume. When critical minerals are missing or represented in deficient amounts, our bodies fail to optimally metabolize and convert amino acids and enzymes into energy. The constitution of marine Plasma mirrors that of human blood Plasma almost perfectly. Like human blood Plasma, it contains 78 minerals and marine co-factors – all at almost the perfect levels needed by the human body. 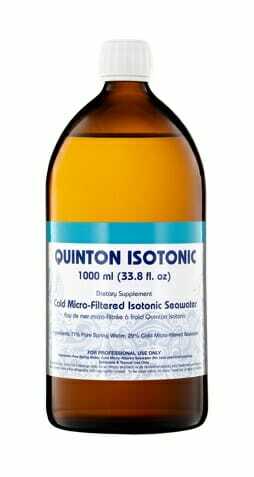 QuintEssential’s hypertonic formula is an ideal solution for restoring balance to the body’s internal fluids, thoroughly replenishing electrolytes and rapidly re-hydrating. Over the last 100 years, QuintEssential Optimum Mineralization 3.3 has been used with remarkable success to restore physiological balance, support gastrointestinal health, encourage the healthy growth of intestinal probiotics, encourage optimal growth, maintain optimal performance, and enhance physiological stamina. It’s very important to sterilize marine plasma for consumption by humans, but the sterilization process must not destroy the “alive” nature of the plasma. There are many health restoring constituents in QuintEssential that are destroyed by UV and/or heat sterilization and so Rene Quinton’s original protocols of COLD micro-filtering multiple times – as opposed to heat pasteurization or UV radiation – are followed very closely to this day to maximize optimal health support. No other seawater product available has this level of history, credibility and research behind it. Prenatal Care: Supports optimal fetal development. Pediatrics: Supplements nutritional intake, optimal growth and development, and cellular hydration. Gynecology: Supports optimal glandular function, vaginal health, and supports normal menstrual cycle. Dermatology: Restores mineral balance necessary for optimal formation of the collagen matrix. Respiratory Health: Helps normalize respiratory function after acute or prolonged stress. Dental Applications: Helps to strengthen gums and promote optimal oral pH and proliferation of healthy oral bacteria. Gastro-Intestinal Health: Normalizes intestinal and physiological pH; Supports the healthy proliferation of probiotics in the intestines; and Facilitates the metabolism of amino acids. Hormonal Production: Supports optimal hormonal production due to the presence of bio-available minerals and amino acids. Neurology: Supports optimal brain function and neuronal development. QuintEssential Optimum Mineralization 3.3 contains 78 ocean-derived raw “living” minerals and trace elements – in user-friendly pharmaceutical glass packaging. Use 1 vial daily, 15-30 minutes before a meal. Hold in mouth for 30-60 seconds, then swallow. Additional vials (up to 3) can be consumed in divided doses prior to meals and bedtime.